"He is wrong. Today at this table, I will kill him." The life of an international spy is fraught with peril and excitement. The motivation for getting into that line of work varies based on the individual, but for some it's a little bit on the blackmail side. 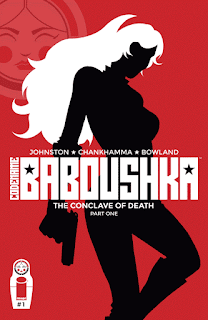 That's the case in Codename Baboushka: The Conclave of Death #1 from Image Comics. The issue is written by Anthony Johnston, illustrated by Shari Chankhamma and lettered by Simon Bowland. The enigmatic Contessa is a wealthy socialite, the last heiress to a noble Russian line—and secretly a deadly assassin! Blackmailed by the US government to carry out dirty jobs even the CIA can't sanction, she's got nothing to lose...and everything to fight for! Codename Baboushka: The Conclave of Death #1 reads a little scattered, mostly owing to the somewhat jarring chronology of events. Johnston chose to start in the present before backtracking a few days, but the recent history doesn't really explain much about the present. Baboushka is seemingly press-ganged into her latest mission, yet Johnston doesn't really provide much context as to why she's sought after and what the stakes are. A lot of the issue plays out this way, where it feels as if there's more at stake than what's relayed to the reader, but it's hard to fully embrace the drama. Johnston's dialogue is a little bland, with characters exchanging fairly stock zingers with one another that feel required for a spy-themed book. There's an interesting illustrative style presented, courtesy of Chankhamma's somewhat naive-looking illustrations. Her linework is very concise, effectively showcasing Baboushka as an extremely agile and capable assassin who can be trusted to get the job done. Chankhamma displays character expressions very well, infusing the book with an appropriate level of drama throughout the book that somewhat echoes what Johnston is going for. Action sequences are telegraphed pretty cleanly, with Chankhamma emphasizing Baboushka handling herself in a way that's believable for what is supposed to be a woman of her talents. The various panel layouts seem to move with the ebb and flow of the book, which also help the reader with understanding the tempo. Codename Baboushka: The Conclave of Death #1 seems to have a lot of ambition as a spy story, but there's something missing in the first issue. Baboushka is definitely believable enough as an international spy type character, despite the somewhat disjointed stakes she's apparently invested in. Johnston clearly has grander things in mind for the series as it unfolds that just don't quite come together in the first issue. Chankhamma's artwork is solid if a little out of place for the content of the story. Codename Baboushka: The Conclave of Death #1 is a first issue that aims for a lot, yet slightly misses its marks here and there. Codename Baboushka: The Conclave of Death #1 is available now.